The simplest way, if your camera has the feature, is using a lower resolution for the image. At the physical size being viewed on the screen there won't be a great deal of image degradation. Not the best choice in doing digital photography but is the simplest. Otherwise you need an image editing program such as PhotoShop Elements or any one of several share ware programs available. I only know PhotoShop so I don't know how other applications go about editing file size. In PhotoShop you can change the image either in file size or the physical dimensions. I have an easier solution. it does all the work; you just upload your pictures. Choose the link for FORUMS. It was easier to turn the 2 bowls than it is to get them posted here. I've got Photoshop. Guess I will have to waite till my grand daughter can show me how to do it. Hey Ed, if you use Photobucket for on-line image hosting, it downsizes your photos as you load them, automaticly! No muss, no fuss, and they can be further edited once you've up-loaded them on the site. I love photobucket. See Mango's post for the link. Thank you all for the help posting photos. I opened it with PAINT and reduced it . The bowls are 8"x2" paduk (sp). See "paduk bowls larger image"
Those are two very impressive pieces. Well worth the wait and thanks for the perserverance to get them posted! Nice pair of bowls Ed! Those are beautiful and I really like the design. Thanks again for the help and the comments on my bowls. Once I figured outh ow to post the pics it was very easy. HKStroud, nice bowl. What kind of wood is that? Thanks Ed, its ambrosia maple. Wife says its strange looking bowl. I really like yours, particularly the color and grain. Does paduk keep its color? What kind of finish do you use? 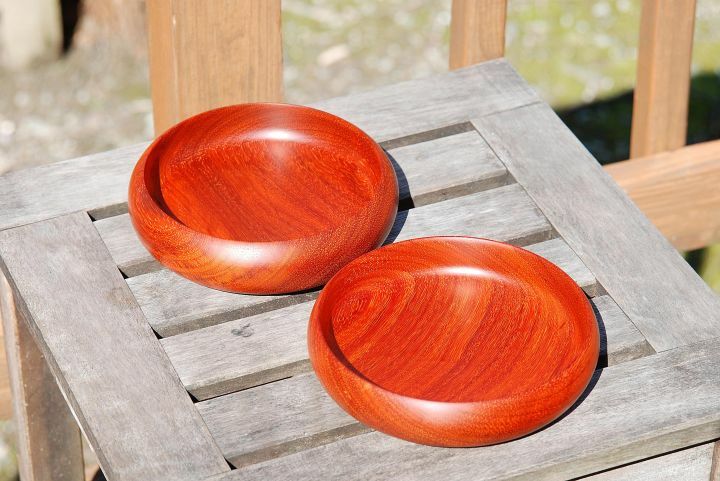 These were the first real bowls that I have made. I made several other practice bowls with cherry, red oak and locust from the fire wood pile. But they were only about 3" or 4" in diameter. First time I used Paduk so don't know if it will keep it's color. The finish is a concoction of 50% Howard Feed-n-wax and 50% bees wax. I've done a little work with Paduk before. It's orange when fresh cut, goes deep red when finished and slowly, over several years, goes to a dark brown. Using a UV resistant top coat, and keeping it out of direct sun light helps it keep the red longer.